New Year’s Eve is the time you want to celebrate with your whole family, but as all parents know, the standard new year’s celebrations aren’t always family friendly or accessible to younger children. That doesn’t mean there’s not plenty of fun for families to have on new years eve. If you’re looking for the right balance of family fun and adult entertainment, we’ve found the best events to suit everyone. From food to fireworks, here are our picks for a family friendly new years for the whole family to enjoy this year. The Winter Circus boasts a delicious four-course dinner, including unlimited wines, beers and soft drinks available all evening. Start off with the champagne reception and canapés to get you into the mood. Once you’ve had your four-course dinner it’s time to party! With a live band and DJ to get you into the party spirit, you can celebrate in style and dance until the new year. There’s also a free photo booth for capturing the fun throughout the night. Guests will get a wristband that also gives you access to the London Eye Fireworks so you can get your fireworks fix. Once the fireworks are finished you can make your way back inside for a free glass of champagne and a selection of breakfast rolls. Entry is valid until 2am, so there’s no rush if you want to enjoy all London has to offer. Abbey Hill Golf Centre is throwing a new years eve party so you can see the New Year in with the whole family. The downstairs function room is for adults to enjoy, featuring entertainment and a selection of food and drink at the buffet to savour throughout the evening. The function room has its own bar and private terrace, as well as a magnificent atrium making the room light and spacious. The children get their own room upstairs filled with fun activities, and all ages are welcome. Their friendly and helpful staff are known for being will make sure your needs are catered to so you can get the best from your final moments of the year, and their food has a 5-star rating. If you’re looking for a New Year’s Eve event that’s more tailored to the kids, New Years at the LEGOLAND® Windsor Resort is perfect. Featuring a spectacular fireworks display at 9.30pm, the kids can get the full new years feel at a reasonable time. An exciting countdown to the fireworks lets younger children experience the fun of celebrating midnight without having to stay up late. Special 3D ‘brick’ glasses will be available, revealing fabulous LEGO® bricks during the fireworks display. There are many rides to explore and dinner is included in the New Years package. Evening entertainment includes meeting all your favourite LEGO® characters. Stay overnight in a LEGO® themed bedroom and receive a complimentary toasting drink to enjoy. The following day, enjoy a LEGOLAND Character Brunch, as well as a LEGO® pirate-themed water play area and swimming pool. 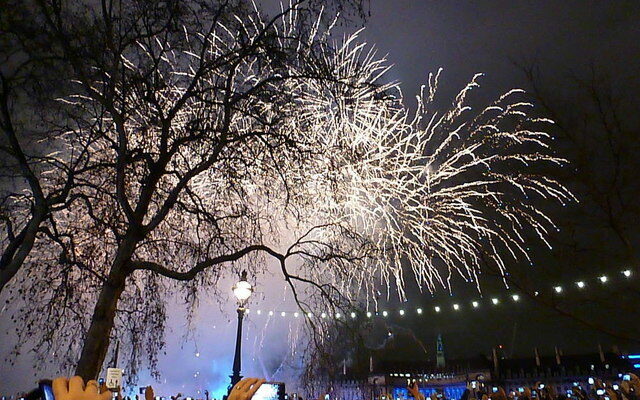 If you’re focusing on the firework displays this new year, the London New Years Eve Fireworks is for you. With the best seats to watch the memorable Fireworks, enjoy the amazing atmosphere in the crowd as you wait to rein in the year. People come from all over the world to see the spectacular display, so you’re bound to meet some interesting people from all over share the experience with. Hear the iconic bongs of Big Ben ring out at midnight and watch as the London sky fills with fireworks as the nation watches. The mayor of London will present the display over the Coca-Cola London Eye and will feature the best music from the year. With easy transport links across London and affordable tickets, the London New Years Eve Fireworks is a great destination for the whole family this year. To get more ideas of where to visit for a family friendly new years eve, or to inquire about any of our other services such as day trips, get in touch with the team at Masons Minibus and Coach Hire. We can provide coach and minibus services for your day trip so you don’t have to drive. Give us a call on 01296 661604 or fill out our short contact form for more information about what we can do for you this Christmas.